If your home is your castle, then your bedroom is the place that you rest and gather up the strength to rule your kingdom another day. Your bed should be a reflection of the rest of your bedroom’s style but should also be inviting after a long day. 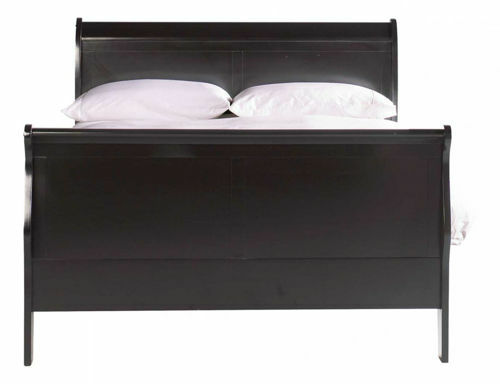 A king size bed is one of the most visually impactful and spacious bed options out there. 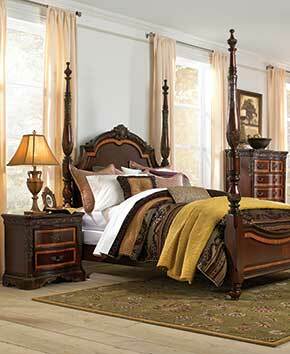 Badcock has a wide selection of beautiful king beds in everything from modern styles to romantically classic designs. 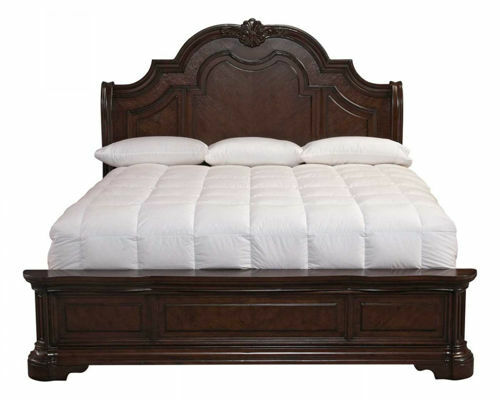 If a king size bed is a bit too much for your space, we also have a great selection of twin, full, and queen beds. When upgrading your bed, don’t forget the mattress! We have plenty of options in a variety of sizes to complete your bedroom upgrade. 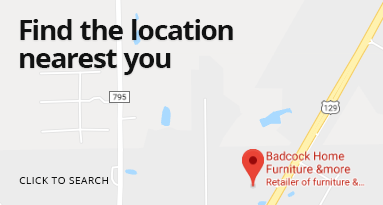 Badcock makes buying a great king bed easy with in-house financing. Because you can never have “too much” storage, the Enzo bed is equipped with two drawers at the foot of the bed for extra space. The gracefully arched headboard has a padded leather section for added comfort. There is also a padded rail on the footboard. Available in Queen and King sizes. If you enjoy late-night reading and opulent aesthetics, then this bed is for you. Its touch light “library bed” LED lighting allows you to read late into the night without disturbing your partner, and its warm cherry finish and old-world flare will upgrade your overall bedroom design. Feel at home with our rustic-modern Homestead slatted bed. Available in queen and king sizes, the headboard and footboard feature a distressed gray finish. Enjoy all of the style and comfort of a luxury cabin retreat from any location. Available in queen and king sizes, the headboard and footboard of this mitered-frame upholstered bed feature a soft linen look centered within weathered pine. The linen-look fabric is made of 100% polyester for easy cleaning and care. The upholstered area is also trimmed with gunmetal nail heads for a finished effect. Crawl into a cozy bed that’s as comfortable as it is beautiful when you purchase the Keaton King bed. With a calming dovetail grey finish, this bed is sure to match any existing décor, and its simple yet modern style will have you waking up every morning with a smile on your face. Match it with the rest of the Keaton Collection and transform your room into a peaceful dream. The panel headboard and footboard of this collection mirror the look of shutters closed up tight on a cold day in the mountains. The same rustic appeal can be found in the dresser, nightstand and chest and when all of these pieces meet in your bedroom’s décor, they’re sure to bring the warmth of a winter lodge to your home. This collection is constructed of solid Ponderosa Pine and Pine veneers to ensure that each piece is solid and stands the test of time. The bed features four wooden slats and four wooden supports so that you can enjoy a full night’s rest and feel completely supported by your gorgeous new bed. Bring the feel of rustic sophistication to your bedroom décor with this collection and snuggle up to in the sturdy, statement bed to soothe your style cares away. Inspired by French classic Louis Philippe furniture, the Lewiston king bed offers grand silhouettes, subtle curvatures and striking design. 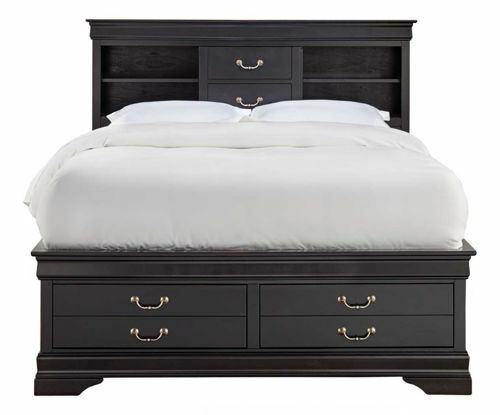 Trim and streamlined, this king bed presents a contemporary version of the ever-popular Louis Philippe style. Constructed of quality engineered wood products and simulated wood grain laminates finished in a sleek cherry color. The sizeable headboard of this king bed allows for placement of decorative pillows so your bed always looks as fabulous and stylish as you. This king bed features a simple look that is sure to enliven your room with comfort and innovative style. The bed boasts a luxurious and sizable padded headboard in a deep chocolate that allows plenty of space for decorative pillows. The 13 slat platform construction allows for the use of a mattress only so no foundation is needed.